Cuban style roasted pork, served with lettuce, tomato, onions, black beans and mayonnaise. Served with Mexican Chips. 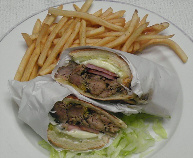 Grilled chicken or beef, served with lettuce, tomato, onions, pinto beans and mayonnaise. Served with Mexican Chips. Ham & Cheese, served with lettuce, tomato, onions, pinto beans and mayonnaise. Served with Mexican Chips. Breaded deep-fried, chicken or beef, served with lettuce, tomato, onions, pinto beans and mayonnaise. Served with Mexican Chips. Teriyaki chicken or beef, served with lettuce, tomato, onions, white rice and mayonnaise. Served with Mexican Chips. Cuban style roasted pork, ham, pickles, mayonnaise, mustard and swiss cheese. Served with French Fries. Grilled chicken or beef, served with lettuce, tomato, onion, and mayonnaise. Served with French Fries. Crisp bacon, lettuce, tomato and mayonnaise on white or wheat toast. Served with French Fries. Homemade meatballs (6), cheese and marinara sauce on French roll. Served with French Fries. Sweet teriyaki chicken or beef, lettuce, tomatoes, onions on white or wheat toast. Served with French Fries.